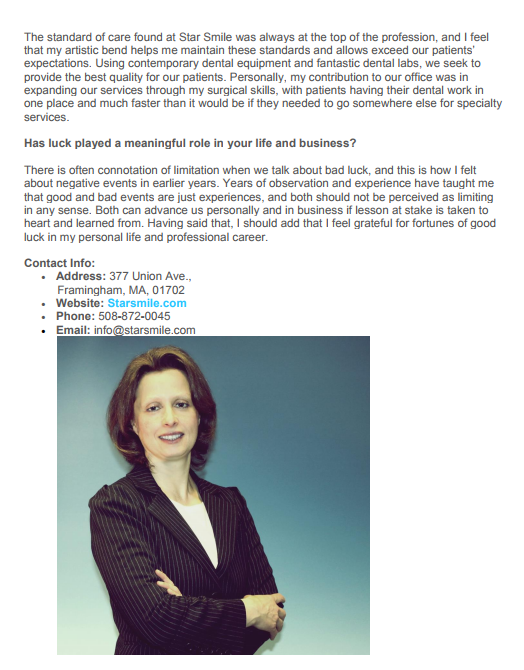 Dr. Kathryn is a dentist in Framingham, Massachusetts, who graduated from Boston University's Goldman Dental School, and has been in private practice at Star Smile Dental Center since August 2003. The main focus of Dr. Kathryn’s practice has been aesthetic, restorative, surgical, and implant dentistry, and is pleased to welcome and treat children in the office. 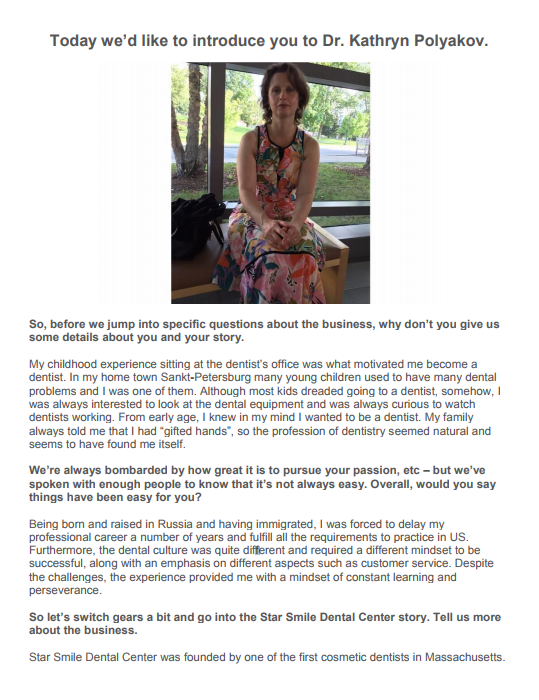 Her dedication for dentistry developed due to her own painful encounters with dentistry as a child in Russia, where she was born and raised, and where as a teenager, made up her mind to become a dentist Dr. Kathryn’s experiences have reinforced her desire to make her patients’ dental experience as comfortable as possible. Her extensive knowledge of dentist services, both an art and science, results in the excellent treatments and outcomes for her patients. Her goal is to make her patients’ lives easier, less stressful, and give them the confidence and joy to smile with a full mouth restoration. 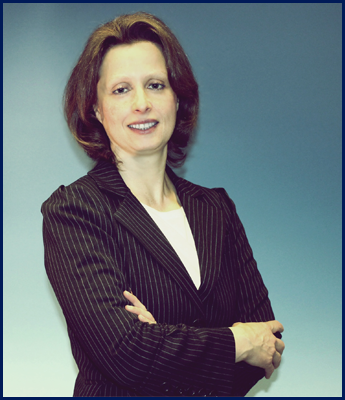 Dr. Kathryn is a firm believer in providing her patients with the highest quality dental care. Her patients’ determination, to improve their lives, makes Dr. Kathryn very proud of her patients’ treatment results and makes her work incredibly fulfilling. Outside of the dentist office, Dr. Kathryn enjoys outdoor activities, traveling, and spending time with her family.